On January 4th, 2017 will mark the 33rd year as a martial artist in tae kwon do. What a journey it has been for me. So many wonderful memories that I am overwhelmed to remember them all. All the friends I have made through tae kwon do has made me rich, rich in friendships. These wonderful folks I have met have become my tae kwon do family. I am so blessed to have my tae kwon do family there for me over the years. 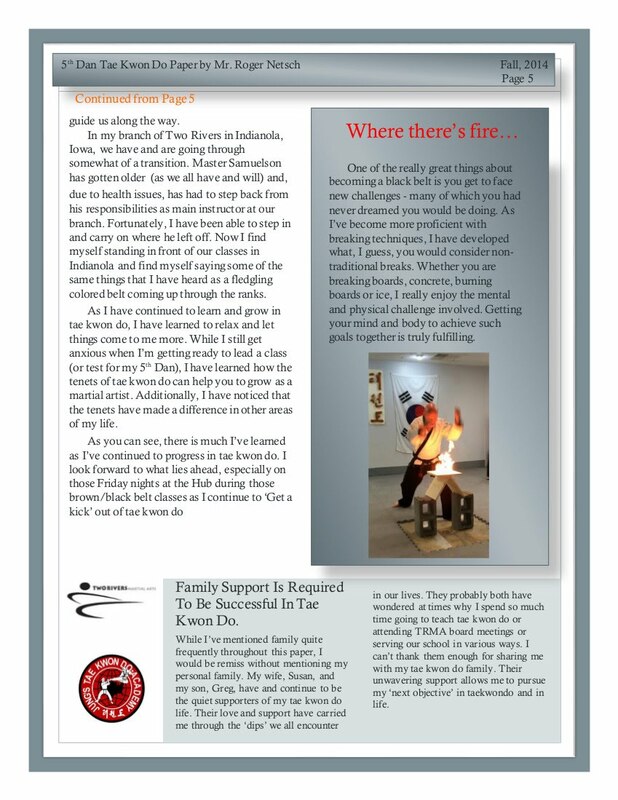 My tae kwon do family has encouraged, motivated and supported me over those 32 years. It could be from a smile, to a bow or talking about tae kwon do to discussions on life events. These are the things I value most with my students, instructors and family members. Having practiced tae kwon do for these many years I have learned to give credit to where credit is due. I would not be here today if it were not for Grandmaster Jung. His teachings over the years has inspired myself and thousands others as a martial artist. I cannot thank Grandmaster Jung enough for bringing tae kwon do to Iowa. I would like to thank my instructors Master Heintz and Master Bair. Both are great teachers and wonderful folks. In fact their teachings over the years has shaped my life. I have learned to become more mindful in my art and in life. I have learned the value for the fundamentals and basics as the true building blocks of tae kwon do. I want to thank my mentors in the art of tae kwon do. These instructors have been role models to me over the years. I want to thank Master Clinton, Master Samuelson, Master Krumie, Master McBroom, Masters Maxwell’s, Master Ferguson, Master Deaton, Master Williams, Master Netsch and Master Siever. I marvel at their talents and learn from them in class. I want to thank all the black belts at Two Rivers Martial Arts. I have learned so much from them over the years and I enjoyed working with them. Finally, I want to thank all the tae kwon do students I have worked with over these years. They in turn have taught me so much. They taught me to learn how to be patient and a better instructor, mentor and role model. I will take this opportunity to thank all of the Jung’s family black belts such, Martial Arts America and New Heritage black belts. It has been an honor to train and learn with these great folks. I would like to highlight Grandmaster, Wood, Grandmaster Wells, Master Doctor Hall and Master Sledge. Their understanding of the art has deepened and impacted my learning of tae kwon do. Tae kwon do has helped me become a better person in life. The tenets of tae kwon do have become instrumental in shaping my tae kwon do practice and in my personal life. Tae kwon do has helped keep me grounded during trying times and ordeals in my life. So many times I have called upon tae kwon do spirit to guide me and get me through difficult times and moments. As Grandmaster Jung states Tae kwon is in your heart and mind. I TOTALLY AGREE with this. This is what makes tae kwon do so rich and precious in our lives. I am fortunate to be testing in Cedar Rapids for a higher Dan rank. After my test I plan to continue promoting tae kwon do as a tremendous family activity. I will continue to train, teach, share my knowledge, and help with testing of students, running our school’s tae kwon do tournament, teaching seminars and helping with self- defense clinics. These are the activities I love and enjoy. Pilsung! When I first embarked upon my journey into martial arts, I was about 15 years old. The father of one of my high school friends knew a Vietnamese gentleman, Ahn Nguyen who taught Kung Fu to a small group of local teens. The lessons were free and typically held during warmer weather in his backyard, but occasionally at a local church or rec center. Until I met Ahn, everything that I knew about martial arts, which was very little, I had gleaned from movies and books about Ninjas and Kung Fu masters who would take on entire armies with their bare hands and feet. Needless to say this was a somewhat skewed view of what I would soon come to learn was more than fighting, but a discipline that would shape me into what I am today and leave me always wanting more. I studied with Ahn until I was 18, at which point he moved away to continue his academic pursuits and returned to college. It was years before I realized how much my training had changed the course of my life. As I got older I would find myself in situations where someone was in need of help, whether they were stranded on the side of the road or being hurt by someone physically, and I was driven to stop and assist them in whatever way I could. Over time I realized this was greatly due to the code of discipline and honor I had been taught as part of my martial arts training. Life seems to be full of coincidences, whether they be finding my way to Kung fu lessons or finding Mr. Netsch at the local farmers market and learning from him about Two Rivers Martial Arts. I have discovered over the years that these so called coincidences are actually the result of what I call "following the path", which basically means, in everything you do try to make the best choice possible and you will be rewarded based on the quality of those choices. I decided long ago that if we had children, at some point when it was appropriate, they would learn martial arts and hopefully find some of the same meaning in it that I have, and so Two Rivers is the perfect fit because we can all train as a family, which is the thing that truly brings all of this together for me. So many families spend their time running from activity to activity, with one or both parents being relegated to the audience and never being able to take part in what their children are doing. 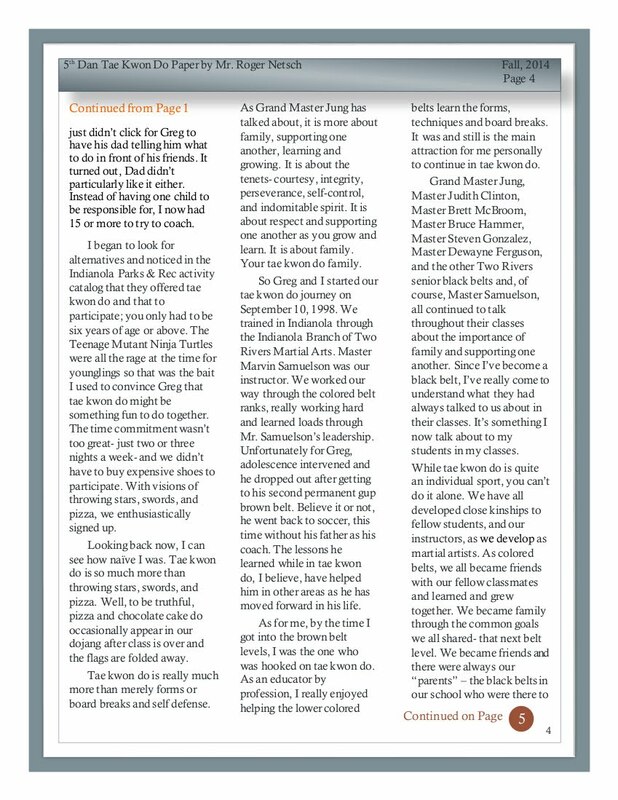 Tae Kwon Do has allowed us to spend time learning and growing together rather than apart, and though we do spend a lot of time pursuing our training, it still affords us valuable time as a family. 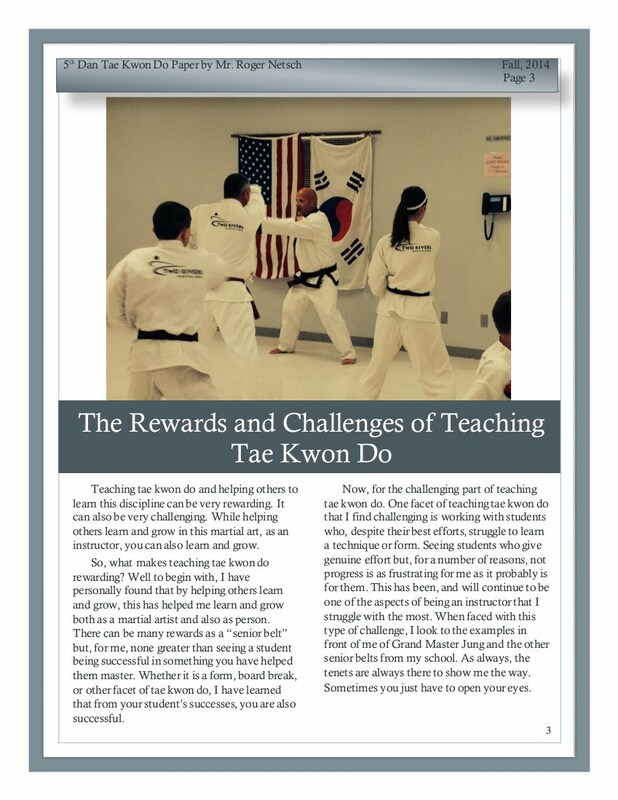 The "Tenets of Tae Kwon Do" so nicely mesh with my own code of ethics and morals that Tae Kwon Do has given me a wonderful sense of belonging, and faith that I am not the only person outside of our family that believes in a strong moral code. Seeing other families training and being able to help others learn and grow as I have, makes the journey much more rewarding than I could have even imagined and even while we are learning to fight and protect ourselves, as well as increasing our physical and mental fitness, we are perhaps more importantly, learning to help each other and work together towards a common goal outside of the competitive nature of society. I look forward to learning more, and having the opportunity to see those I have helped achieve even greater success in their own personal journey, which is what I believe Tae Kwon Do truly is, a journey and I find myself just as excited, if not more so, when someone I have helped succeeds in a goal, like their board break, as when I do. Lucky is such an inadequate word to describe how I feel about being able to be involved with Two Rivers and all of the great people I have met along the way. I owe a debt of gratitude to and have tremendous respect for everyone that has helped me reach this level, from Mr. Netsch who introduced us to the school, and Master Samuelson who presides over our branch and mentors each of us to Mr. Anderson and Ms. Kingsbury who are always willing to offer help and advice no matter what the challenge is. Two Rivers is like a home away from home for us, I feel great loyalty to and have considerable respect for Grandmaster Jung, Master Heinz and all of the Masters and Black Belts I have encountered during my training. Our matriarch Master Clinton makes everyone feel welcome and is never at a loss for encouraging words or, when needed, stern direction. In addition to Master Clinton Two Rivers is also flush with truly great and inspiring mentors and patriachal figures including Master Hammer, Master Ferguson, Master Gonzalez, Master Deaton, Mr. And Mrs. Master Maxwell, Master Williams, and Master Mcbroom. In the interest of time and trees I will not attempt to list all of the wonderful black belts who have helped me through the years, suffice it to say they are numerous and like the Masters listed above have my eternal gratitude. Training in the Martial Arts, in whatever form they take, is one of the best ways I have ever found to instill confidence, discipline and a moral code, and like any other endeavor worth the effort, it is a lot of work, but the rewards are immense. If I can even come close to the level of knowledge and discipline I have encountered during my training I will have succeeded in my journey so far. I wish to offer my sincerest gratitude to everyone who helped me get here and I look forward to what the future will bring. The date was January 30th, 2010. I sat outside this place called “The Hub” in my truck; smoking what I hoped would be 1 of my last cigarettes. 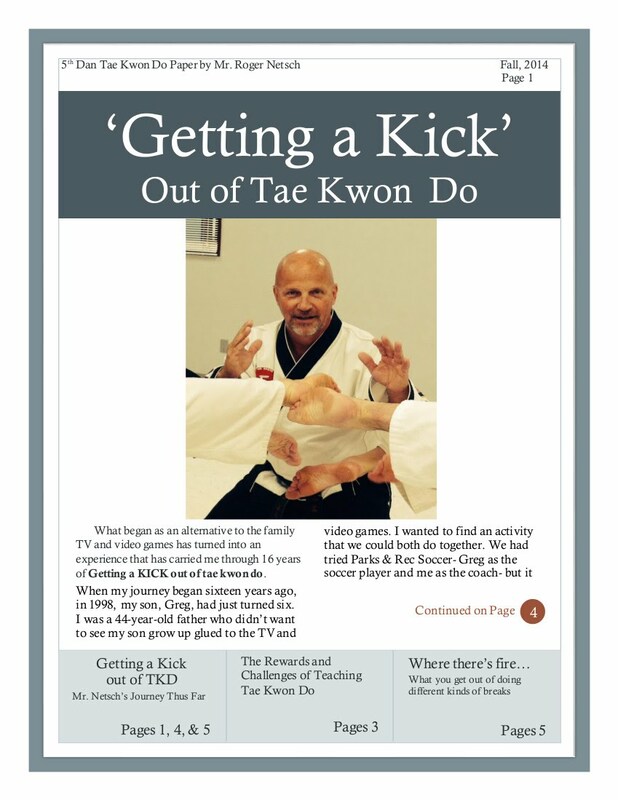 I got talked into coming over to the south side of Des Moines to check out a Tae Kwon Do class by Mr. Shaw, as I was literally looking for anything to assist in helping me quit “killing myself to live” (i.e., smoking cigarettes). I’ll never forget that day. As I walked into the building everyone I met looked me in the eye and said hello. Everyone was very cordial and welcoming, even though they didn’t know me from “Adam” so to speak. I would start my Tae Kwon Do journey the next weekend. As I sat down on the floor with Master Hammer, I knew this was it. Master Hammer was very welcoming, and to this day I don’t think he knows how much of an effect he has had on my journey. I’ve made sure to let him know in person that the 30 or so minutes he spent with me had a dramatic impact. I have tried Martial Arts before in life (Judo, Karate, Tae Kwon Do twice), but I knew it would be different this time. I would be a SE Polk student training under Mr. Bond for the foreseeable future. The 1st month was very challenging as I tried to work my body out of a physical “slumber” and into shape to handle Tae Kwon Do workouts. I had a few classes behind me when the 1st Bethany tournament hit my radar. I really only knew a few basic moves, and my form Chon-Ji. As a white belt, I participated in the Board Break & Forms competition. Turns out I tied for 1st in Forms, and went to the Grand Championship round, where I won 1st again. It was right then I knew the bar had been raised. Over the next few months, I started working out in the mornings trying to get my body into shape to keep raising the bar to my own standards / vision of what I could become as a Martial Artist. In September of 2010, I built my own Do-Jang in my house. It was around that time I became a Green Belt and would start going to 1 Friday night class a month. My 1st class I was “tagged” a couple of times when sparring with Black Belts, and knew I had to work on my sparring skills in addition to everything else. I kept the attitude of just trying my hardest, and not get down on myself. The main thing I did not do was judge myself in relation to everyone else. I kept telling myself this was my journey and to do the best I could. It has literally felt as if belts have been coming and going very quickly, so it has been important to me to just enjoy every workout, and try my hardest every time I’m in the Do-Jang. I have had a broken rib, shoulder & back injuries, foot injuries, and even pulled some muscles in places where I didn’t think I could pull them. The more I workout, the better I know my body and what I am capable of. I have done things I didn’t think I could do when I started, but my perseverance has been “fruitful” in trying to get things to happen. I think as a 1st Gup Permanent Brown Belt staring down what may be the most mentally and physically challenging thing I’ve ever done, in a Temporary Black Belt Tae Kwon Do Test, the best thing about my journey so far is two-fold. 1 being my mental and physical health. The other is the friends I have made along the way. I honestly feel I am a part of something special. I want to succeed in this Test not only for my own goals, but for my instructors and other Black Belts who have spent countless hours guiding & training me. I want to succeed for those who have had patience with me while I battle injuries and life’s inherent struggles that have caused me to miss entire sessions, and for my family who has seen the best in me even when I don’t. The vision that I started out with in February 2010 is finally starting to come to fruition, but I remind myself daily that it is yet another step in my life’s journey…for that I will always be thankful for my instructors, friends, and family. The list starts with my primary instructors Mr. Bond and currently Master Williams who have taught me countless lessons in Tae Kwon Do and life itself. Two Rivers senior student/instructor Master Clinton who may not know how much she has taught me, mostly by giving me confidence in our random talks; always with a smile and making me feel like I was the most important person in the world at that point in time. Master Ferguson has been my “Saturday” instructor for the duration of my “Brown Belt” time spending hour after hour sitting in front of me after class calling out forms and 1-steps, or standing next to me while I work on movements in front of the mirror…all while smiling no matter how many times I mess up. The list of people who have impacted me seems to never end (Mr. Siever, Mr. Gookin, Master Deaton, Mr. Shaw, Master Hammar, etc), and for that I’m truly blessed. And most notably my family and friends, without their support I wouldn’t be the man I am today. The real definition of Tae Kwon Do is “a modern Korean martial art similar to karate” according to the Oxford Dictionary of English. Its origin is Korean and means literally “art of hand and foot fighting,” in which tae is to kick, kwon is fist, and do is art or method. It is rumored that the first Tae Kwon Do techniques began in about 50 B.C. When Tae Kwon Do started Korea was divided into three distinct kingdoms. They were Silla, which was founded in about 57 B.C., Koguryo founded in 37 B.C., and Beak Je founded in about 18 B.C. It first appeared in the Koguryo kingdom, but Silla's Hwarang warriors are responsible for spreading the art throughout Korea. The Hwarang made a military academy for the sons of royalty in Silla called the Hwarang Do, which the form Hwarang is named after. Hwarang Do means ''the way of flowering manhood.'' They used a form of martial arts that is very similar to Tae Kwon Do but it is called Taek Kyon. It was spread out in the Korean peninsula because of the Hwarang Do, because they traveled around to learn about other religions and people. Their education was based on the Five Codes of Human Conduct, written by a Buddhist scholar, and they are fundamental education, Taek Kyon, and social skills. They have been changed and are now: Loyalty to your country, respect your parents, faithfulness to your spouse, loyalty to your friends, respect your siblings, respect your elders, respect your teachers, never take life unjustly, indomitable spirit, loyalty to your school, and finish what you begin. In 1945 the very first Tae Kwon Do school was started in Seoul, Korea. Modern Tae Kwon Do combines combat and self-defense techniques with sport and exercise. The name was invented by Choi Hong Hi who claimed to be the founder and creator of Tae Kwon Do by the International Tae Kwon Do Federation. To me Tae Kwon Do means a way of defending yourself in bad situations and a way to have a lot of fun. There is a lot of discipline involved in it and it is a good way to get rid of bad energy by working it off in class and testing your memory with all of the forms, form meanings, one-steps, and movements. My favorite part of Tae Kwon Do is the board breaking because it is not like when we do basic movements in class because you are allowed to hit something that has a higher density than your hand or foot and learn to not hurt yourself. It is a good way to discipline yourself to do something and a very good way to stay in shape and keep moving. I think Tae Kwon Do helps with hand-eye coordination and with your reflexes because when I started, I did not have the best of reflexes and now I have very good reflexes. I would like to thank Master Samuelson, Mr. Netsch, Mr. Anderson, Ms. Kingsbury, Master Clinton, Master Gonzalez, Master Hammer, Master Ferguson, Master Deaton, Master Williams, Master McBroom, Master Maxwell, the other Master Maxwell, and the rest of the black belts for helping me through and teaching me everything I know. I would also like to thank my parents for driving me to class and paying for the classes that I am in. Information cited from: Taekwondo history world marital arts academy, Wikipedia, and the Oxford Dictionary of English. My training started as many others did. Connor, my son and nearly seven, was excited about becoming active outside the home as well as having some fun. Tae kwon do appeared to fit that well and so he began, with me watching from the bleachers seeing if this was something that might interest me. I've always liked to play sports but haven't done so on a regular basis for many, many years. My wife and I were also working on getting in better shape, so I thought I'd give this a try as it looked intriguing. Both Connor and I soon realized that we enjoyed the classes and I knew my participation would also help him do his best. It was something special that both of us could do together. Connor thought it was cool to be a rank ahead of me and I liked working with him learning his skills. Many times he started off pessimistic about doing his board breaks and remembering his forms, but with some good encouragement and explanations he became to understand what and how he needed to do them. When he broke his boards he became very excited and wanted to keep going to show me how easy it had become. However, I'm still working with him, at times, to understand that some things take time to learn and master, but with some hard work and perseverance one can improve what they can do. With tae kwon do, I enjoy learning and trying different things. I work at understanding each technique's practical aspect so that I might know how to apply it in a practical sense. This is one of the reasons I have tried the Olympic style tournament sparring. I believe it provides a more intense and physical scenario of what it might be like if you actually needed to use these skills to protect yourself. Although an actual threatening situation is not a sparring match, it does improve agility, speed, stamina, and helps foster the automatic movements needed to protect yourself. The addition of the self defense techniques adds to the practical aspects as well.I greatly appreciate these being added to our training as this was something I hoped to learn when I began. Everyone at TRMA has also fostered an excellent atmosphere for learning and cooperation. The enthusiasm and dedication of the instructors and fellow students help all of us stay excited about what were are doing while still keeping it fun. As it's often said, you won't do what you don't like. Staying active was a large part of why I began training. A few months prior to training, my wife and I joined the Altoona Campus fitness center in a means to lose a bit of "excess" weight and we both have done well attending the gym for the first few months. After several months at the Campus, I found out I have a difficult time working out only for my own benefit. By taking part in tae kwon do, it gave me a sense of fitness level that I needed to maintain to continue enjoying this sport. This provided an extra incentive to improve my conditioning well enough to get through a standard class as well as add a bit of competitive spirit. I started out a bit awkward and unsure of what I was doing., but I quickly found out that I needed to do more outside of class to get what I wanted from it. Again the practical aspect of what I was doing helped drive me forward. I still have a long way to go, but I'm proud of what I've been able to do during this time and will continue to do better. Steady gains have been made with my fitness level and during the last couple months have been working harder in preparation of my test. I believe I'm nearly in the best condition for over 20 years and I hope its enough to look good on test day. One of the surprises during my journey is the fun of learning the nuances involved with the forms and technique. As an engineer I strive to understand the parts that make up the whole. 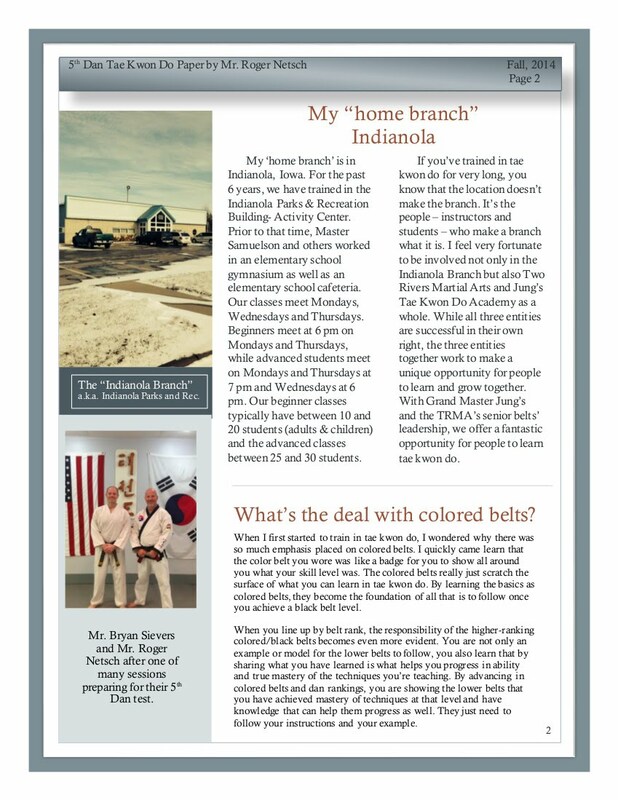 This may, at first seem unimportant, but in my view this is what makes the art of Tae Kwon Do intriguing, fun, exciting, and challenging. The fact that one must learn to be relaxed to be quick, relaxed to conserve one's energy, and relaxed to provide the power only when needed seemed like such strange idea to me at first, but over the last several months I have been able to realize its importance. Looking back, my time in TKD I can see the progression that was made up to today. Working on learning how my body can do what is asked, as well as movements, stances, and showing the proper technique and power to demonstrate our expected skills. I have much yet to learn, such as adding gracefulness to the techniques, but I look forward to the challenges. Possibly this gracefulness comes from relaxing the muscles, but I'll need to learn more. From my experience as a drummer this could make sense; tense muscles are more difficult to respond. For me this is one of the few challenges that I am still working at overcoming, the others being cardio conditioning, and breathing. Progress is being made in these regards as I am beginning to discover how to do just that. During this journey we are asked to understand a small bit of Tae Kwon Do and Korean history through the forms we learn and the meanings of the flags. Over time, I began to realize that there is a purpose to the madness. The genesis and development of TKD are rooted in the customs and culture of the people who create it. I believe palgwe forms and the Korean flag have the most profound references to what makes up TKD and their philosophical point of view. The concept of dualism to help explain the nature of the universe is actually quite intriguing. Numerous examples can be provided indicate the concept such as: Love/caring and discipline are used to help raise a well rounded child; being serious and easy going as the situation demands, balance in one's diet, helping others as well as yourself, and so on. Each provides an philosophical concept of a state of well being in every day life. I'd like to thank my instructors, including Mr. Bond, Mr. Gookin, Master Ferguson, Master Clinton, and Master Gonzalez for providing guidance and a solid example of the tae kwon do spirit. It is my sincerely hope that I will be able to demonstrate this as clearly to others and keep the spirit alive and strong. I look forward to continuing my journey and improving skills, techniques, relationships, and health as well as helping others with their journey. Even though my anticipated shoulder surgery this summer will stop my training for several months, I know there is much more to learn and I eagerly await the upcoming challenges. What Tae Kwon Do means to me is that I can fulfill and overcome. It means that I am strong, but that I can also control myself. Tae Kwon Do also shows me that I can do anything that I set my mind to, even if it seems impossible at first. Tae Kwon Do is something really special that I have gotten to experience that most kids could ever even dream of doing. That is what Tae Kwon Do means to me. I joined Tae Kwon Do because I was always getting picked on in school. I picked Tae Kwon Do because it teaches me both self-defense and how to attack. Another reason I joined was because I needed something fun to keep me occupied and in shape. I also just wanted to have something to do with my family. Tae Kwon Do has helped me grow and mature by teaching me to respect adults and my peers. It has helped teach me how to preserver even if it seems too hard to achieve. Tae Kwon Do has helped me mature by teaching me self-control whether it is in sparring or if it is to help me suppress my anger. Tae Kwon Do has made me stronger both physically and mentally. Tae Kwon Do is something that is really important to me in my life because it helps me stand out and be more unique. It also has helped make new friends in both Tae Kwon Do and in school. It has also given my family a chance to bond and hang out together. I have learned a lot about martial arts that I did not know before, like how technique is a lot more important than power. I have also learned how to preserver even through pain and exhaustion. I am thankful for my mom, dad, and grandma because they were always there to usher me to and from Tae Kwon Do, even if they had something else going on. My whole family and all of my friends have been here to support and push me through my experience. I would also like to thank my instructors for mentoring me and helping push me through my journey. If one would compare Tae Kwon Do to climbing Mt Everest, this upcoming temporary black belt test is like reaching the base camp. This test is not the end of the journey, but the beginning. I look forward to beginning my real education in the martial arts. Twenty three years ago I started my training with Master Heintz at the old Black Belt Academy. An injury followed by life itself delayed my return to martial arts. I was lucky enough to find Two Rivers, and it has felt as if I never left training. Although, I will concede that waiting 23 years to become eligible for Temporary Black has tested the tenet of Perseverance on my resolve. This second time around has had much more meaning to me. I am able to enjoy this journey with my family. It was not long after Jacob and I started classes that Mallory became quite eager to join us. Jule came along, at first for the novelty, and now enjoys the experience in her own right. Leading the very busy work life that I do, having an activity that the entire family enjoys is very special and unique. Aside from the time at class, this will give me a bound to my children that I hope they will remember long after I am gone. One of the unexpected surprises from Tae Kwon Do class has been the friends that we have made over the past two years. We have gotten to know and spend time with some great and fun people that we probably would have never met. It is great to spend time with our new friends outside of class, and most of the time now we talk about things other than TKD and the school. Many people have been supportive of my journey to this point. I would like to thank Mr. Brown and Mr. Siever for taking on the roles of my primary instructor, first in West Des Moines and then at the Hub. I would like to thank Masters Williams and Ferguson for all of the extra training, support and encouragement they have offered over the past three years. Most of all, I owe a great deal to my wife and kids for going on this journey with me. They have sacrificed a lot of family time in the past few months as I increased my training for this test. Having them here with me, makes coming to class worthwhile. Tonight is the last night of Hanukah for 2012. If I make through and pass then I guess great miracles can happen.